As a loud whistle blows, two Marines drop to the floor and begin a set of ten push-ups. The Marines then race to the middle, grab a baton and begin sparring. 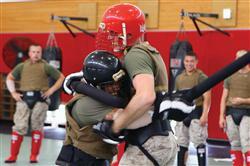 7th Communication Battalion began Martial Arts Instructor Training on Camp Hansen July 29. The unit, part of III Marine Expeditionary Force Headquarters Group, III MEF, is conducting training to increase the number of Marine Corps Martial Arts instructors in the battalion. The training session began with a safety brief, where the instructor trainers explained the rules to ensure the Marines would not get injured, followed by one-on-one sparring and group sparring sessions. The course teaches Marines to develop their entire body while also focusing on intellectual and character discipline, according to Cpl. Jonathan R. Brown, a military policeman with the battalion. The appeal of the course is not only its physical challenges, but the character building and mental aspects as well, said Staff Sgt. Attikus W. Piper, a company gunnery sergeant for the battalion. The Marines complete Marine Corps Institute courses, hold Professional Military Education sessions and attend Corporals and Sergeants courses to prepare mentally, according to Dean. For the physical and character-building portions, the instructors help the Marines train and then sit down with them to talk about how the training also strengthens their core values. The course not only teaches discipline, but helps younger Marines learn what it takes to be a true leader.